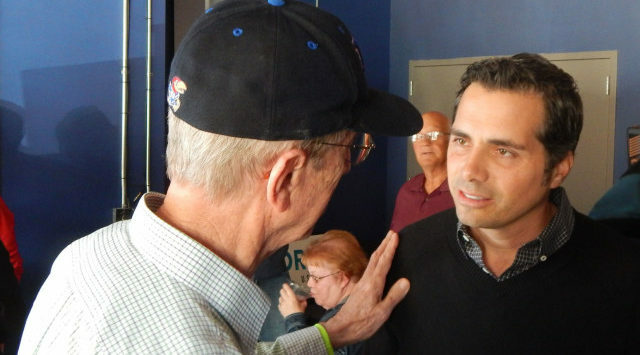 Greg Orman is trying to make political history in Kansas. The businessman is traveling the state, bringing with him a message that change is needed in Topeka. Not just a change of current leadership but a change of both parties, republican and democrat. He is trying to be elected governor as an independent. Orman tells KSAL News that his message of being an independent is resonating with those people he talks with. Recent polls indicate Orman is trailing both Republican Kris Kobach and Democrat Laura Kelly. But he says he is not discouraged. Orman believes there are still plenty of undecided voters out there. Many Political experts contend that a vote for Orman is indirectly a vote for either Kobach or Kelly. He says that’s absolutely not true. “A vote for me is a vote for Kansas,” Orman says. Orman says this election is a chance to “send a message to politicians” in Kansas. He doesn’t think the choice could be clearer for Kansas voters, and “the only way you waste your vote is to vote for one more republican or one more democrat,” he says. This is not Orman’s first attempt at public office as an independent. He unsuccessfully challenged incumbent Republican United States Senator Pat Roberts in 2014. Advance voting in Kansas is currently underway, ahead of next week’s general election.